Growing up in an underserved community, David Riera learned about the power of gardening. Now he wants teens to reap its rewards. Riera and other volunteers built the Urban K Garden at Kinloch Park Middle School. It boasts tropical trees, vines and a butterfly garden. It also has raised beds for vegetables, herbs and flowers. It serves as a living laboratory where students apply what they learn in the classroom about plants and animals, pollution and the environment, conservation, and food and nutrition to real life. The completed garden was recently unveiled to the community at a ribbon-cutting event. 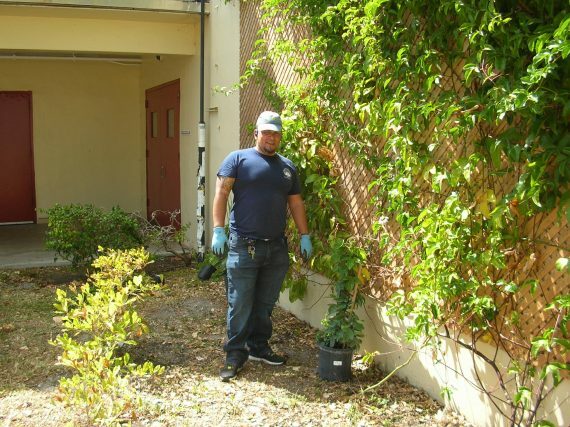 FIU Ph.D. student David Riera plants tropical trees at the Urban K Garden in Kinloch Park Middle School. Located in Little Havana, 97 percent of students at Kinloch Park Middle School receive free or reduced-price lunch. Its students primarily come from diverse exile and immigrant communities from the Caribbean and Latin America. It’s a community not unlike Allapattah, where Riera grew up. He hopes the Urban K Garden will be an outlet for the school’s underrepresented and at-risk youth to learn, work, socialize and gain self-confidence. The garden project was spearheaded by Hope for Miami and was made possible by the support of FIU’s Center for Leadership and Service, Flamingo Road Nursery, Lowe’s, Nature Works Everywhere, Pine Island Nursery, and Wells Fargo. It was completed in nearly 14 months by Kinloch Park students; parents; teachers; neighbors and FIU students from the university’s Garden Club, its South Florida Beekeeping Association, and its chapter of the Minorities in Agriculture, Natural Resources and Related Sciences (MANRRS). Riera, who serves as president of the FIU chapter of MANRRS, aspires to start a junior chapter at the middle school to promote the academic and professional advancement of minorities in agriculture and related sciences. He regularly consults school administration on how to maintain the garden, and he wants to install a drip irrigation system to sustain the garden while school is not in session.